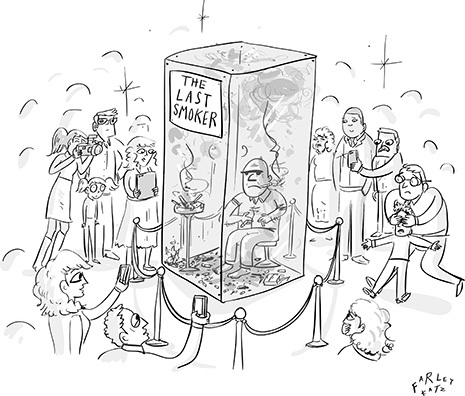 Smoking hot cartoons to kick off 2014! Note: Click any image to enlarge. Use back arrow top left to return to this page. But then I got distracted – a favorite pastime of mine! – and ended up losing the links to two of them. Well, patience (or procrastination) is a virtue because just yesterday I came across a strip and cartoon that are blog-worthy. So here they are, to start off another New Year. This took me back roughly 30 years. I was working at McDonnell Douglas Astronautics Co., now part of Boeing, and had gone into the very large cafeteria on the mezzanine floor of Building 101 where I had my lab. As soon as I entered I could smell noxious cigar smoke. This was mid-afternoon and the cafeteria was empty save for one individual in the designated smoking section located at the far end. I just turned around and left. Cigars are the worst!! !